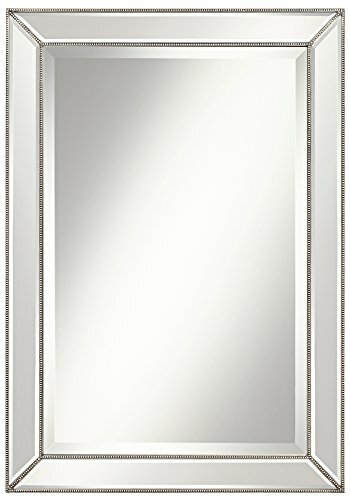 Add the finishing touch to your decor with this stunning beveled mirror. The large shape allows you the versatility to hang on a wall or lean against a wall. The beveled glass is surrounded by a double beaded trim in a cool toned Palais silver finish.- 24" wide x 34" high x 1 1/4" deep. Hang weight is 18 lbs.- Glass only section is 18 3/4" wide x 28 3/4" high. 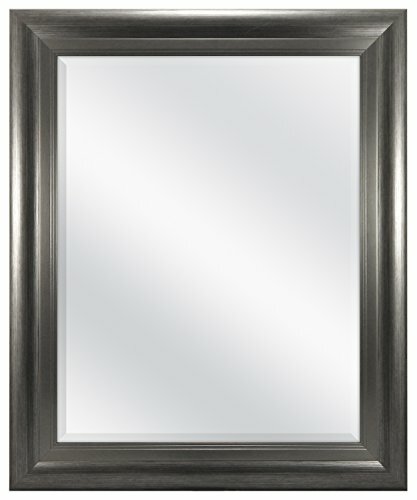 Surrounding frame is 2 1/4" wide.- Rectangular wall mirror from Uttermost.- Silver pewter finish. Wood frame construction.- Doubled beaded border. 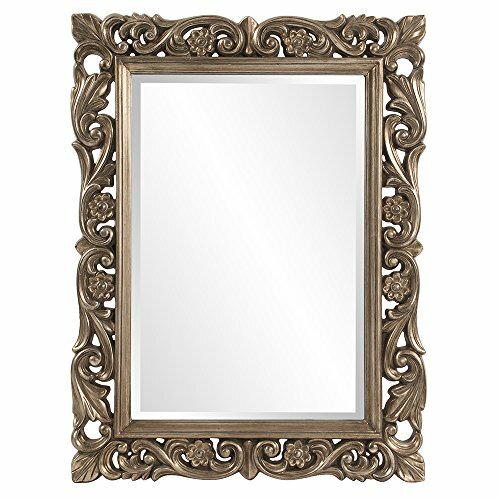 The Chateau Mirror features an ornate rectangle frame complete with scrolls and flourishes. It is then finished in a antique French pewter. 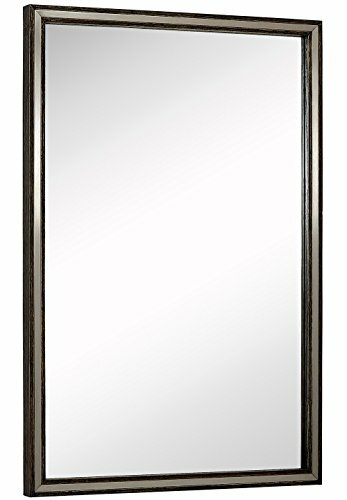 The Chateau Mirror is a perfect focal point for an entryway, bathroom, bedroom or any room in your home. D-rings are affixed to the back of the mirror so it is ready to hang right out of the box in either a horizontal or vertical orientation! The mirrored glass on this piece has a bevel adding to its beauty and style. Howard Elliott has been redefining the home furnishing and hospitality industry with innovative designs of decorative mirrors, accessories, and occasional furniture since 2001. Lifestyles change the way we live and Howard Elliott’s mission is to create exceptional products which truly finish a room. Howard Elliott distinguishes itself from our competitors with the effortless adaptability of our product line. Versatility, style and customization are just a few of the features built into every item we produce. We are constantly refreshing our look with new finishes, fabrics and designs keeping us, and therefore you, ahead of the game. With everything that we offer, Howard Elliott is sure to be your most valuable accessory and occasional furniture resource. Hamilton Hills Large Metal Inlaid Wood Frame Wall Mirror | Glass Panel Silver Stainless in Pewter Gray | Vanity, Bedroom, or Bathroom | Mirrored Rectangle Hangs Horizontal or Vertical 24"
Our rich dark black wood stained rectangle wall mirror is a timeless piece, offering elegance and old world charm while constructed and designed with modern principles and a contemporary feel. The wide 1 1/4" features a brushed stainless metal inlay down the center of the frame that is 1/2" thick. Total exterior dimensions of 24" x 36". This mirror a show piece for any bathroom, powder room mirror or something in your dining, living room, waiting room or office. Our substantial frame surrounds the large 21 1/2" by 33 1/2" center plate glass. 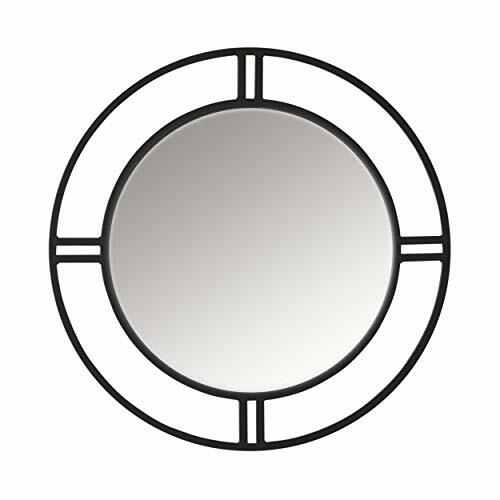 Our mirror comes secured to the frame to add stability and to prevent distortion or warping. Our mirrors include pre-installed slimline 1/4 inch hanging hardware hooks for hanging your mirror in both a horizontal or vertical fashion. We stand by our products and your happiness with a 100% money back guarantee. A USA Company with 3 Generations of Family Values. With all the classic elegance of its namesake architectural style, the Palladian mirror by Safavieh is a timeless treasure. 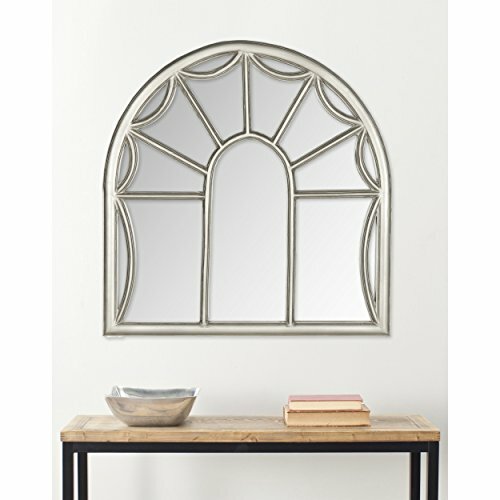 Crafted with glass inset in its pewter-finished wooden frame, this traditional design evokes the look of an arched window. (Make the Palladian mirror the focal point of any room, foyer or hall). Our clean contemporary modern framed mirror is a show piece for any room whether you are looking for a bathroom, powder room mirror or something in your dining, living , waiting room or office. A clean substantial 3 inch brushed metal looking frame surrounds a large 1 inch beveled glass center. Looks like metal but avoid the hassles of metal fingerprints and rusting or oxidizing with our frame. 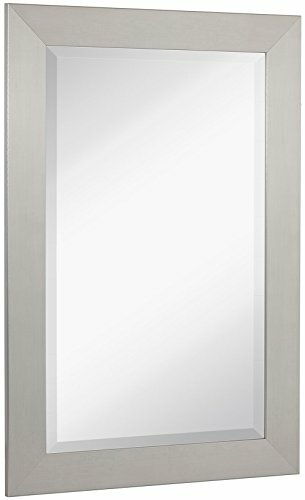 Plate glass solid silver backed mirror is securely embedded in the frame to add stability and prevent distortion or warping. The mirror comes with our pre-installed slimline 1/4 inch D-hook hanging hardware for both a horizontal or vertical (landscape or portrait) installation. We stand by our products and your happiness with a 100% MONEY BACK GUARANTEE. USA Company with 3 Generations of Family Values. MADE IN THE USA. 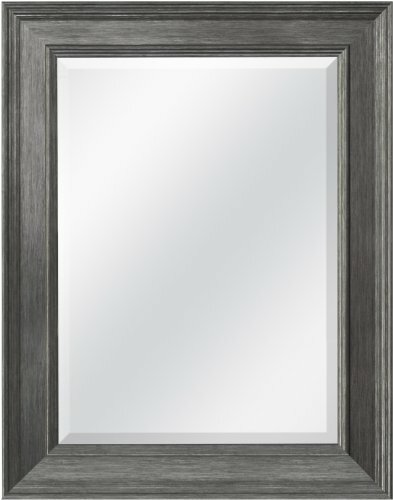 Looking for more Glass Pewter Mirror similar ideas? Try to explore these searches: Disney Princesses Invitations, Think Tank Shoulder Harness, and Gold 4 Claw. Look at latest related video about Glass Pewter Mirror. Shopwizion.com is the smartest way for online shopping: compare prices of leading online shops for best deals around the web. 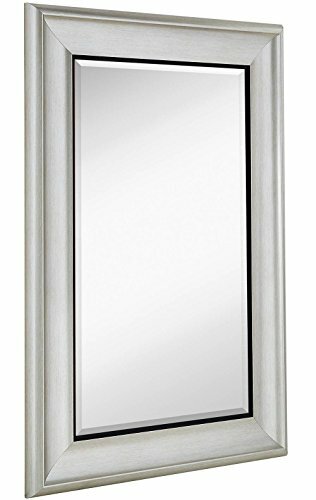 Don't miss TOP Glass Pewter Mirror deals, updated daily.